The attempts at humour, pointed though they are, are sometimes more than a tad cartoonishly broad, while the overall dramaturgy might not be as watertight as one might wish. 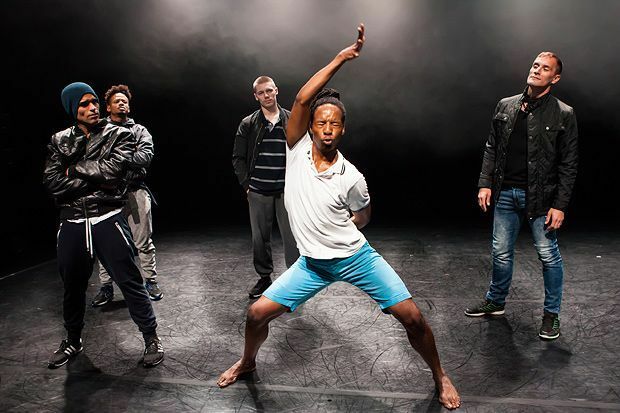 But what makes this hour-long hunk of dance-theatre by Anthony Missen, co-founder of the Manchester-based Company Chameleon, truly matter is the knockout dancing of an all-male cast. There are passages of consistently powerful, graceful and occasionally even thrilling movement here that wake you up and shake you. The show’s thematic through-line is masculinity. Missen and co are examining how an individual’s embodied behaviour relates to pack mentality. As they demonstrate, the law of the jungle tends to negate vulnerability among men, and there’s scant possibility for relaxed touch or tenderness. It’s when the dancers stop trying to be funny or exaggerating their actions that their work really flies, transcending the need for explanations or easy answers. Standouts among the cast are Lee Clayden, Thomasin Gülgeç, Mbulelo Ndabeni and Missen himself – experienced performers with a deep facility for expressive motion. It’s Clayden who finally seizes attention, first as the dark keeper of two equally slithery ‘dogs’ (Gülgeç and Ndabeni) and then in a tremendous, literally stripped-down climactic solo that packs layers of rage and haunted solitude into a few memorably charged minutes. Dance Base, 225 5525, until 30 Aug (not 24), times vary, £10 (£8). A subversive comedy exploring male group dynamics, choreographed by Anthony Missen.